Online Home Income Blog recommends the Blogging Business as number “THIRD OPTION” to Earn Money Online. Many people including me were making a great monthly revenue through Blogging. So What is Blogging all about? Blogging is a website where you can share your experience and ideas by writing articles which are called blog posts. You can start a blog for any niche and based on your passion and the interest in the subject. For an example, take a look at my blog and I use to blog for Earn money online without investment and is all about it. I have shared much information about 5 Legit ways to earn money from the Internet. Here I shared my own experience in earning money online from the computer by working at home. I am having the most recent collection of articles updated on my blog regularly. I am sure this blog will be useful to you but you wonder if I say this blog makes some money apart from other online jobs. We can make some money from our blog in many ways such as Promoting Affiliate products, selling advertising spaces, selling E-Books and other stuff related to electronic products, CDs etc. But those methods will work only if we have our own website and also a decent number of visitors visiting our blog regularly. In this article, I have explained how to make money blogging? and this article has three sections includes five steps to create a blog and install Google Adsense or Adhitz to generate revenue from your blog. So spend your valuable time to get through the ideas shared in this article and start make money from blogging today. 5.) Marketing your blog and monetizing. If you decided to go for online jobs from home, then making money through blogging is the best way you need to opt for. Choose from the best topic that has a broad exposure and also, that wasn’t already covered by other established bloggers. In such cases, you will be more successful in attracting the audiences, thus it helps self-marketing by itself, and making money through a variety of methods as described above (in ways of blog/website monetization). Choosing a topic for your blog is a little tough task, but most successful blogs are those who do for hobby, fun, entertainment, showing their career or some specific and miscellaneous knowledge. Once you have decided on a suitable niche for your blog, its time to write relevant articles based on the topic you have chosen. Choose a specific niche and not a broad topic. It is always better to write for sub-topic related articles rather than a broader topic, which will attract more visitors. Write an article about “How to make money from affiliate marketing focusing only on Amazon and flip-kart?” and not on the general topic “How to make money from affiliate marketing?”. Showcase your own experience and thoughts of action, by adding more informative contents in your article on the topic chosen. If you target to make money from blogging, then you need visitors to your blog/website. If you need visitors, you need worthwhile contents to visit and read. Though it takes time, howsoever you need to work around this and there are no shortcuts. So, you decided a niche for your blog/website and had written some articles based on the topic or niche you chose. Now its time to create your blog. The first thing that comes to your mind when setting up a blog is getting a good domain name and reliable web hosting solutions. Many peoples opt to create a free blog using WordPress or Google Blogger. But it’s not recommended at all. Because you can’t utilize the complete resources and this cause restricted monetization method. So, it’s better to start with own domain and own hosting. Continue Reading: How to start a successful blog in 2019? Starting a free blog to make money is a good option to start with, but keep in mind, they have limitations on how you can make money from blogging? Most free hosting providers limit the resources and they won’t give continuous long-term free service. They may discontinue your blog service at any time. Hence, my best advice is to go for Paid hosting services buying own hosting plans. Choose an easy to remember, short, keyword rich, top-level domains for your website/blog. Going for own paid hosting offers greater customization and control of your blog/website, and monetizing your blog. So, all things are ready to kick start your blogging as you have decided the topic, wrote a few articles, completed blog setup. Now its time to publish your blog and express your thoughts on your blog/website. Keep in mind that, the blog/website is a virtual face where you will be displayed in this world. Hence, express your experience and thoughts in such a manner that it will be more informative and niche related contents. Your best expressions get you attracting visitors to your blog/website, thereby providing a chance to monetize in such a way it will make money through the rest of the blog life. Write original contents instead of copying from others because readers will be interested in learning new things. Update frequently on your blog/website as this will bring more visitors to your blog. Keywords are very important and they were highly related directly to the topic of your blog. Choose relevant keywords for all your articles which will increase your blog visibility in Search engines and attract more readers. Use the Google Keyword Research Tool to get a guide to choose your keywords wisely for your articles. Include keywords in meta tags, headings, inline paragraphs, keep in mind, never overuse the keyword, (Results in keyword stuffing, and probably degrading your blog). Use Social Media Platforms such as Facebook, Twitter, LinkedIn and classified sites such as Craigslist and Forum sites to show that you are available. People won’t naturally find you if you don’t put yourself out there and so, use such resources effectively and genuinely. Having your own domain, interested in earning from your website while you sleep, then monetize your site by focusing on niche related content. Yes, then GOOGLE AD SENSE is the first recommended method by Online Home Income Blog to earn money from your website. Google earns most of its revenue by allowing other website or advertisers to advertise their products or promotional ads on their search pages. In turn, Google getting paid for the work they do. Now, Google allows their users can share some percentage of these earnings through their AdSense program. In this program, you should plug your blog with them and lease a few spaces in your blog pages to display ads or text/images on your web pages. This method of make money from blogging is more advantageous and can surely help you to earn a handsome income. If you have your own domain and a web-space you can able to display Google ads on your posts. You can display either as a cost-per-click (CPC) or cost-per-1000-impressions (CPM) ads, while ad-sense for search results pages show exclusively CPC ads. When a visitor lands on your page and clicks an ad in your page, you will get a certain amount paid[from $0.001 to $1 and more] by Google for the work you have done for them. The commission you earn from Google Ad-Sense depends on your site traffic and the number of unique clicks through your pages. It may vary from 2 cents to about $10 per click. One cannot estimate the particulars of their earnings from their web pages and it purely depends on your site traffic and your web page content. One way to earn more from google ad-sense is to create a competitive keyword which helps you to drive more traffic to your site. THE MORE COMPETITIVE SEARCH KEYWORDS, THE MORE YOU EARN. The earnings you got mostly depends on your targeted traffic you receive to your site, placement of your ads and of course the amount per click you receive. Read the article, where I explained how to make money from Google AdSense? CONTENT SPEAKS ON YOUR WEB PAGE. The quality of your content is the most important thing which provides an impact on your revenue. If your site serves rich contents and competing keywords which helps google crawlers easily find and suit your concept surely you can have more interested users to visit your site often and in turn increase your Ad-sense earning. How to Start Your Earning? Once you created your website, then go to https://adsense.google.com sign up and start showing ads on your web pages. There’s no cost to join and getting started is quick and easy. After u became a member of Google Ad-sense, log in and complete your website profile. Then, create your ad code and implement in your pages and sit back and see your earnings. You can view your earnings at any time by logging in to your account. Also, you can able to see the total number of page and ad unit impressions, ad clicks, click through rate, effective CPM, and your total earnings. How to Create a Site for Ad-Sense? Before creating your site for Google Ad-sense you must get a relevant topic to meet the most searching topic of the era. You must be good knowledge on the topic you deal with it. Monetizing blog is everything in all about money making that puts your effort including producing quality contents and attracting readers, in turn, earning from that high potential traffic into the money-making platform. For successful blogging, you need a strong base in your niche you choose to blog and must know updated marketing techniques and more-over you need to invest at the beginning. Although, don’t think the more pages in your site increases your Ad-sense revenue because more content with lesser pages drives more traffic than the less content with many pages. Simple, when you finished building your site with rich 20-30 pages content then go to https://adsense.google.com and apply. Wait for a day or two, once you receive your confirmation mail from them and then log in to your account. Select relevant ads, and get HTML codes. Paste the codes on your site page and sit over simply. Sit back and see you’re earning raises. You can have the option to display text ads or image ads or banner ads. ADHITZ is one of the best alternatives for Google AdSense. They work similar to Adsense and they offer PPC(PayPerClick) as well as CPM(cost per impression). Adhitz is another great ad network as they allow a wide variety of Text Link and Banner Ads to display on our website which pays almost from $0.08 to $0.20 for specific geotargeted traffic. One of the best parts of them is they pay almost for all clicks that our websites receive instead certain ad networks pay only for clicks generated from specific countries. Since Google Adsense payout is more as high as $100, many small website owners suffer due to this large potential. But, the adhitz payout is comparably smaller as $25 through PayPal (or) cheque and it is mostly welcomed by many small website owners. ADHITZ SITE SPECIFIC ADS: You can also sell advertisement space from your website in Adhitz network so that advertisers can bid for your site and provides ways to earn even more than $100 to $1000 every month. The commission you earn from AdHitz depends on your site traffic and a number of unique clicks through your pages. It may vary from 2 cents to about $10 per click depends on the advertising agency whom they displaying ads on your pages. We, –ONLINEHOMEINCOME WEB SOLUTIONS– provides services for creating and monetizing websites for very affordable and competitive prices. Start a website with us and earn a residual income of more than $10-$50 every day within 7days. Create a website with related contents and sign in for a “Publisher Account” in Ad hitz Account. After logging into the account, Register your website. Then choose your preferred Ad’s and get your HTML CODE. Copy and paste the code’s in your preferred webpage and that’s it. Sit back and watch your income grows. Meanwhile, update your site content frequently and do SEO’s to increase traffic to your site. Start a blog on a niche you have already know about unless it will be difficult to start making income. Online Home Income will provide you complete support from registering a blog to design and launch of your blog. 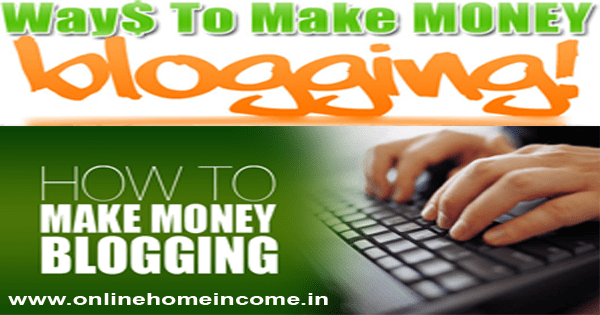 Make Money from Blogging is one of the really successful methods in 2019 and I am personally have developed many bloggers who are making money on their own. I hope this article has given you a few knowledge about Creating a Blog and Monetizing to generate revenue for you. Post your comments and ask your suggestions below.